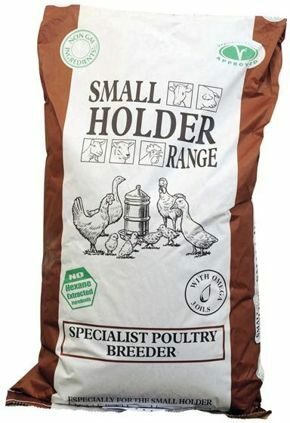 Specialist Poultry Breeder is a high energy and high protein pellet for breeding birds. Ideal for rare breeds and hybrids. For good strong egg shells and optimum nutrition, treats should only be fed in the afternoon, after your birds have eaten their pellets and no more than an egg cup full (around 20g) for each bird should be given. Feed from 6-8 weeks before breeding commences and throughout the breeding season. Provide on an ad lib basis, they will require about 100-150g per bird per day. Introduce a new feed gradually over 7 to 10 days to help a smooth change over. This feed should be fed with ad lib fresh water and grit should be made available at all times.